Not everyone in the world is crazy about soy milk or tofu, but I was dead curious about making it myself and it could be useful to vegetarians, health nuts, and lovers of asian cuisine. One of my favorite things about Japanese culture is that I continually find that they have a use for every stage of something. They will even make use of impurities, as you will find out about shortly, as in the case of nigari. I think it’s important to remember that homemade soy milk will never taste the way processed soy does. In scouring the internet for information, I have found many complaints about how their soymilk tasted ‘beany’, while just as many say they prefer it to the soy milk found in stores. I’ll certainly say, for myself, that the fresh, warm soy milk straight out of the pot is pleasantly subtle and that once cold it is very strong in that so-called ‘beany’ flavor. When I added vanilla and a bit of sugar I found that the ‘beany’ flavor vanished completely and was very pleasant to drink. It is not a thick liquid at all, rather more like the consistency of water. Not to worry, however, if you end up not liking the soy milk, an overwhelming amount of them did, however, exuberantly explain that the tofu made from it was the very best they’d ever had the pleasure of eating. So, if you don’t like most of the stages this process entails, there is always an alternative use for the materials. You’re only stumped if you don’t like tofu and, really, most of us aren’t going to make something we already know we don’t like or can’t tolerate. Moving on toward soy milk: Boil six cups of water in a large enough pot, pouring the soy puree in and mixing it over medium heat until a froth begins to rise. It rises very quickly, so be prepared to keep stirring, turn the heat to low, and even remove the pot from the heat for several moments to keep it from running over. (I was successful escaping spillage the first time, but when I reheated the soy milk, I ended up with a burner full of soy froth, so definitely watch it!) Simmer on low for ten minutes. Note: this part of the proccess is extremely important in order to cook out an enzyme present in soy that inhibits the digestion of protein. Once done simmering, we must now filter out the gritty bits of the soy in the pot. Using a fine cloth, or layers of cloth such as muslin or cheese cloth, (or a pillow case) lining a colander works well. I used a few layers of paper towels and had no grains of bean in my milk. Use a receptacle large enough to catch all of the soymilk that will filter through beneath the strainer. To make sure to get all of the soy milk through, let it sit for twenty or thirty minutes and then gather together your cloth and twist it tight around the captured grit, squeezing the last of the soy milk out. Be very careful as either the milk or grit can still be very hot, thick rubber gloves will help with this. (One can neglect waiting time for it to drain on it’s own, but product will still be boiling hot.) Pour two more cups of water over material being filtered to wash out more soy milk and repeat the squeezing process. At this stage you now have two products: soy milk and okara. The latter is the remaining grit from the soy beans, resembling bread crumbs, and are yet again useful. Okara can be put into soups, used as a thickener for onion, mushroom, and curry sauces when ground fine. Balled up with garlic, onion, ginger, and bound with cornflower and deep fried. Added to breads, pancakes, muffins, and so on. If it isn’t palatable to you, it’s a source of excellent protein for livestock such as rabbits, chickens, cows, and so on. I tried to dry out mine naturally but it remained too wet even after the second day. I think next time I’ll try drying it out in oven. The next stage is tofu. Staggeringly like making cheese from milk, the process uses a coagulator. In this case, the two most readily available are ‘Plaster of Paris’ (gypsum) and Epsom salt. The traditional coagulator is nigari, a bittern made from the impurities in sea salt. (See my article on salt, which explains the process) Nigari reportedly makes the smoothest flavor and texture and should you desire to use that coagulator over the more readily available ones mentioned, one can find it for sale online. I have found a resource stating that using gypsum adds calcium to the tofu. You can begin making tofu the moment the milk is done. Cold soy milk can be warmed back up and simmered for five minutes before the following is performed. When I made this, I used epsom salt since the thought of Plaster of Paris unsettled me. It worked very, very well and cost a little over two dollars for a quart of it. For the proportions here, mix one and a half teaspoons of epsom salt in a half cup of water until dissolved. With the soy milk hot but off an active burner, gently stir in the coagulator into the soy milk one third of the volume at a time. The reaction will be quick and soon tiny beads of tofu will be floating around in a yellowish liquid. Let the pan sit for another 10-15 minutes to finish coagulating then strain. The yellowish ‘whey’ can apparently be used in things such as bread making and so on. Once the tofu curds have mostly drained, wrap the material over the top and place a saucer (or other small, flat object) over it and set a weight on top. My source material mentioned using cans of food from the cupboard, I used a heavy jar of sauerkraut. It’s about gently pressing more liquid from the curd, allowing it to compact together and be as firm as you like. When I pressed my tofu I let it sit for about 8 hours and it made very firm tofu. One source claims 45 minutes with a 20 pound weight will yield firm tofu. Experiment with times and weights to vary the softness of your tofu until it suits you. Tofu presses (in plastic or wood) are available online, should you want to make it regularly with ease or prefer a box shape to a domed one. Presses (and tofu sets) can be located here and another here. 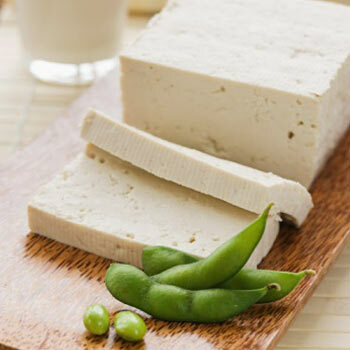 I found that one cup of dried soybeans yielded 7 cups of soy milk and one cup of tofu. Storing: Soy milk and tofu lasts for a week in the fridge. Tofu should be covered with water, replacing the water every couple of days to keep it fresh. And that’s it! Enjoy your soy milk and tofu! When I hadn’t tried my tofu for myself, I watched Miss Britt eat half of what I’d made in a matter of minutes–and raw! She enjoyed it very much, which just makes me feel very proud of myself. I had mine earlier today in a bowl of miso soup, and I found that it truly was the tastiest tofu I’ve ever had. The consistency was excellent and it’s mild flavor was pleasing. What are you waiting for? It’s so easy! Go make some! This was so easy I was astounded! I love soy milk. I lived in Taiwan for 2 years and that’s where I developed this taste for soy milk. At the beginning I couldn’t stand soy milk but I was told that by the end I would love it. This advice was true. I like soy milk cold and hot. Soy milk doesn’t sound the easiest to make. I would suggest you taking a look at http://www.bigcrazystore.com. They have a list of soy milk makers that make the process much much easier! While Web wandering seeking info about tofu in general I happened upon this blog entry. May have to give it a try some day!!! Thanks for the info and competent writing. Thank you so much for this! I’ll have to try this ASAP! Hi there! Thanks so much for your question! Ultimately, I think you should try! You never know if it will work or not until you do. It may be a terrible mess, or it could be the beginning of a food revolution. If you do, please let me know how it goes, okay? Soooo it took me a while to get my hands on some Epson Salt and a good chunk of time, but I finally tried it yesterday and… Fail! My only thought is that maybe I shouldn’t have boiled the Lupin in addition to soaking it. I just heard in a few places that it is toxic if not prepared correctly (animals do not touch it in nature). Hello! So great to hear from you! I’m sorry to hear the Lupin beans didn’t go well for you. My only thought is that the chemical reaction of Epsom salt and soy is not working with Epsom salt and Lupin. You see, tofu and dairy cheese go through the same process, but each needs something specific to make it happen. When milk or soy milk is heated, it ‘denatures’ the proteins in the liquid, which really just means that instead of floating around as complex structures, they’re all strung out and shapeless. When you add Epsom to soy or rennet to milk, it causes the proteins to wind up tightly together and solidify, making a coagulated version of semi-pure protein. So, after that science lesson, my guess is there is an unknown catalyst for Lupin beans. Which makes sense, but doesn’t help you get bean curd. It seems to me that you can either experiment with more Epsom salt to see if that will help, or resort to soy beans after all. Also, I would definitely keep cooking the Lupin beans. Soy are not poisonous, but they inhibit digestion of protein (so, basically, you’re eating the soy beans for nothing) if you don’t cook the enzyme out of it. Because you said Lupin are toxic without cooking, another thing you could try is to cook it for two or even three times the length you would normally boil soy, because maybe it needs more time to break down the toxins. I hope that helps and thank you for coming back and telling me how it went!